It has been quite a while since I reviewed anything I liked from the DC universe, but last Christmas I got me one of those Injustice: Gods Among Us figure 2-packs. 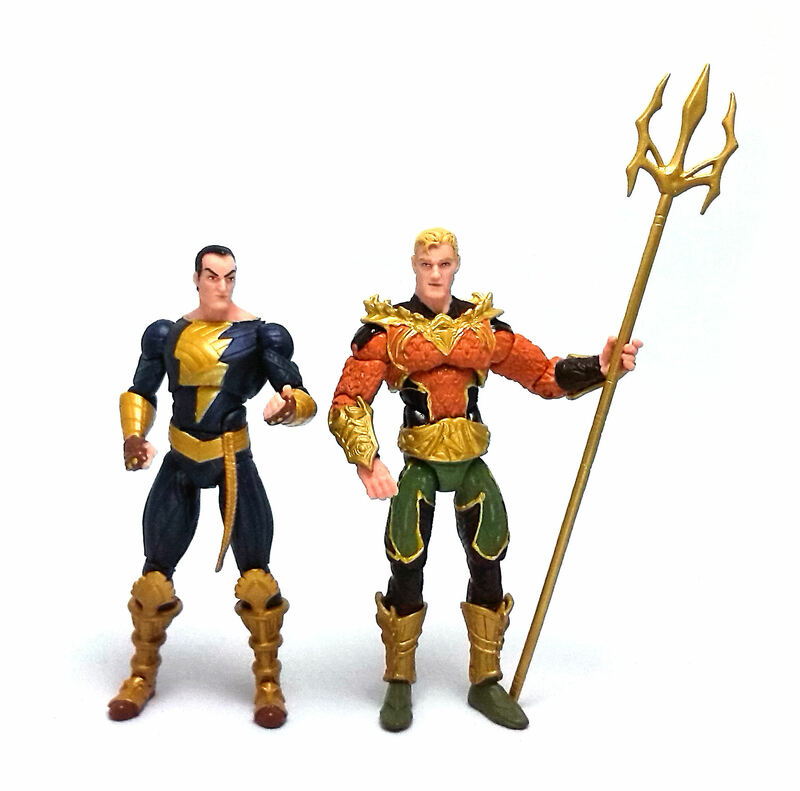 The set I got features Aquaman and Black Adam, and I was quite impressed by both of them, although today I’ll focus my review on King of Atlantis himself, Aquaman, sculpted by the legendary Jean St. Jean. 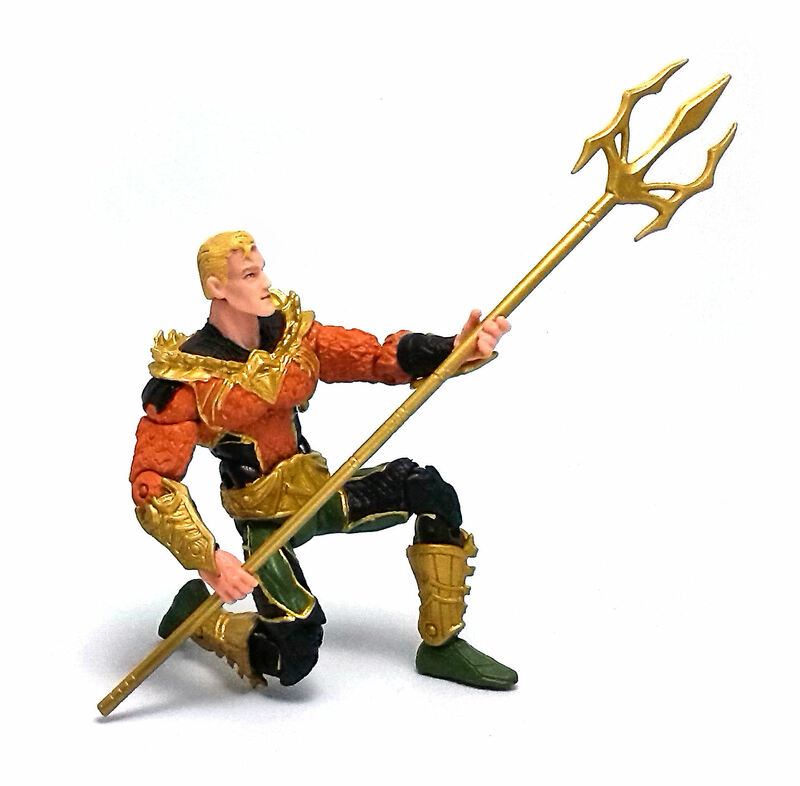 My affinity for Aquaman comes from my Mego days, as he was one of the characters I had a figure of as a child, and one I remember particularly because I lost it on a cab trip and was never replaced, but I digress. This incarnation of Aquaman has a very different appearance now. His costume design comes from the video game Injustice: Gods Among US, published by Warner Bros. Interactive and developed by NetherRealm Studios. The costume was redesigned to incorporates pieces of very ornate armor over a more familiar garment underneath, with the heavily textured shirt and green trousers, although these pieces now also display black panels that were not present in the Silver Age version of his costume. 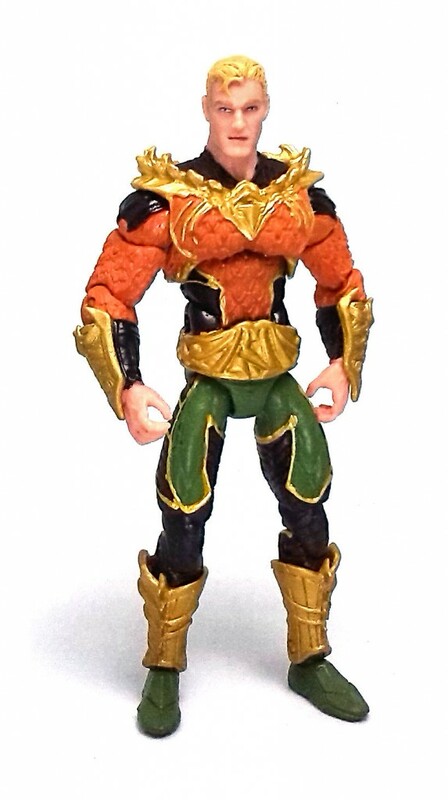 Aquaman’s head sculpt is very good, opting for the beardless, well groomed look. The facial features are suitably heroic and remind me a lot of those pulp heroes depicted in old Flash Gordon posters. • Barbell mounted upper torso. This is a very impressive articulation design, especially when you consider all this fits a 1/18 scale action figure, despite the limitations to the range on some of them imposed by the character design. 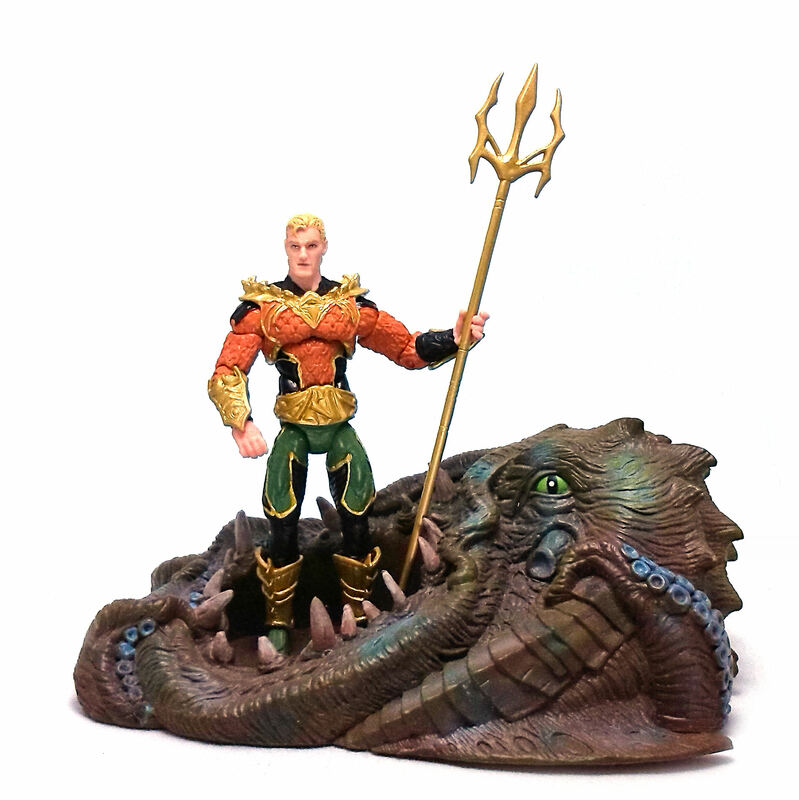 Aquaman is every bit as versatile and fun to play with as any Marvel Universe figure ever made. One other thing DC Collectibles really excelled at is the paintjob. I have had nicely painted figures from several other lines before, but this is the first time I have gotten a figure this size painted perfectly. No paint speck out of place, nice, vibrant coloring and subtly shaded facial features boost Aquaman right to the top, even above my former favorite, movie Hellboy by Mezco. 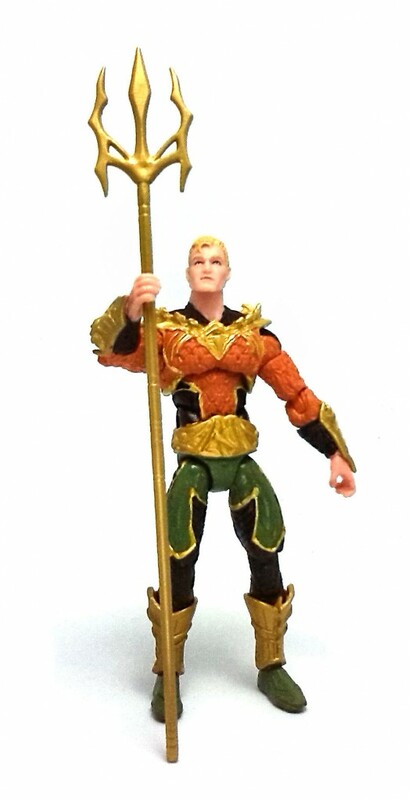 Aquaman comes with only one accessory, his golden trident. 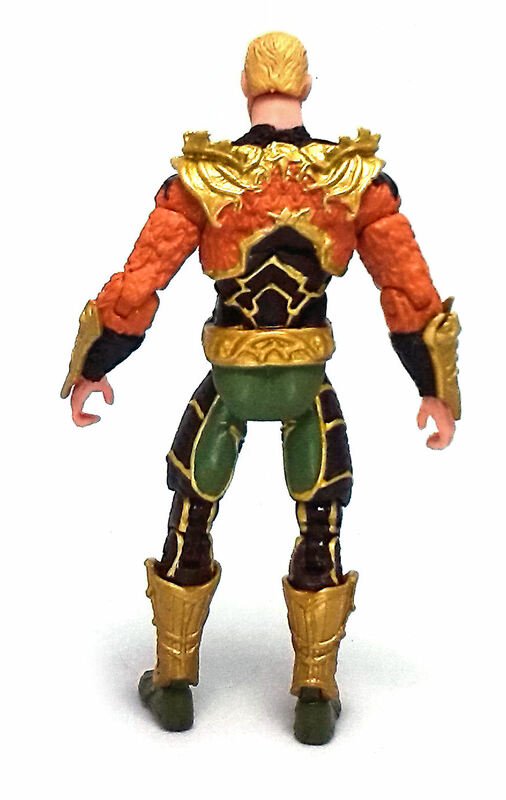 I cannot say if this weapon comes painted or was molded in a bright gold plastic, but whatever the case, the color is a good match for the color used in the pieces of armor on the King of Atlantis. The trident is made of a fairly rigid plastic, but the way it was put into the package caused it to curve ever so slightly, which may take some heat and time to correct, even though it is not that much of a distraction. Even though Aquaman is only one half of a set, this rendition of him turned out so good that they could pack rocks in the other half and I would still be happy about my purchase.